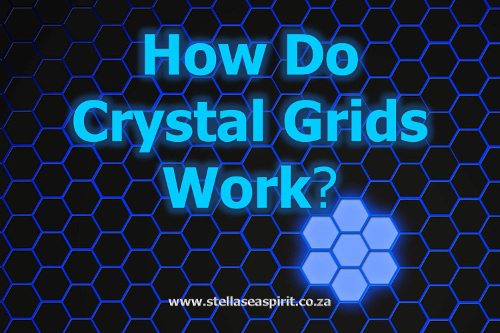 What a crystal grid is, how and why it works, how to make your own powerful crystal grid for crystal healing and crystal magic. A free energy source in Atlantis and Ancient Egypt, a means of cosmic connection between different realms and for its revitalising and restorative properties. I often meditate holding crystals or place them around me in the four directions. If I am performing ritual I may set them out in a circle around my workspace to contain the vortex of energy raised with myself acting as the generator in the centre. Your physical reality is oscillating all the time with your dominant thoughts, feelings, mood, attitude and actions. When you experience a shift in perception it manifests an immediate change on the etheric level but takes some time to filter into the denser form of matter. Essentially your cells catch up to your consciousness. > What Are Crystal Grids? > How Do Crystal Grids Work? A crystal grid is a set of selected crystals that are attuned to a specific purpose then placed in a distinct sacred geometric shape such as a circle, spiral, infinity symbol, square, triangle or hexagon. What crystals do when activated in a grid like formation is intensely magnify your intentions for the energy transfiguration you wish to take place. This energy current travels through the crystal grid in the Earth, where some crystals are the size of two storey buildings, further anchoring this into the physical plane more rapidly. In addition the high frequency with which clear quartz crystal vibrates carries your intentions into the higher spiritual planes and improves your ability to communicate your intentions into the ether as well as receive wisdom from Spirit (or your preference) about them. As you may know, everything in existence stems from an original Source energy given a nonphysical form that derives from an archetypal essence or blueprint which then filters from the astral into the physical realm. Similarly, imbalance begins in the etheric bodies and filters into physical manifestation of symptoms so it makes sense to begin incurring change on the astral while aligning with that intention in physical ways so that you can support that etheric blueprint into form. By working with crystal grids to do this it helps you step into that space that supports who/where you are now, while also holding the space for where you are going next. In general you can set up a crystal grid for a long term purpose to act as a vortex consistently drawing in energy for example; peaceful home, happy marriage and business prosperity. Or you can set one up for the duration of a specific project, for example, while you are dating to find your best match or while you are writing your book for fluid communication and muse. When you work with crystal grids in this way you set in place a consistent stream of energy amplifying what you are creating 24/7 and drawing in life force energy that matches that, dispersing it in the most appropriate way for you. If you are short on space or privacy, the other option is to set the grid up for a short amount of time to beam a precise, powerful spiral of light into the matrix and then let it go so that you are detached from the outcome and undistracted by thoughts about when or how the magick will come about. By deconstructing a grid you are not shutting your intentions off, simply instruct the sentient flow of energy to continue its purpose until it is complete. Working with crystal grids in an intuitive and sacred manner on a regular basis will increase your flow of alignment and keep you in tune with your core self, bringing greater states of peace, love and happiness into the present moment which generally underlies whatever result we are seeking to begin with. Above we looked at what crystal grids are and the two main reasons for why you would want to construct one in the first place. 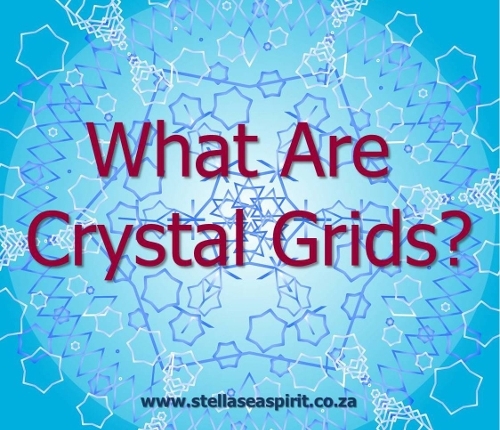 Now let’s delve deeper into how crystal grids actually work as well as why co-creating with clear quartz crystal in particular is so powerful. Quartz crystal is a mineral also known as oxide of silicon. It is composed of one silicon atom and two oxygen atoms which due to the piezoelectric qualities of quartz forms a spiral of solidified energy. Interestingly, these three atoms form a mathematical calibration so that all clear quartz matches the frequency of the Great Pyramid of Giza in Cairo, Egypt. Structurally each piece of clear quartz crystal is a functional pyramid able to connect with other dimensions through electromagnetic communication frequencies. Just like the Great Pyramid with a layer of quartz beneath it acts as a cosmic broadcasting station connecting Earth to other universes. In this way clear quartz crystal operates outside of time and space. The charge emitted is a neutral stream of pure life force energy direct from Source which is only given expression through the varying levels of consciousness that engage with it and therefore it can be harnessed to either create or destroy. Within your physical body; in the blood and connective tissue of the brain, spinal cord and nerve fibres are large amounts of silica (Si02). This is what helps you elevate your vibration, heighten awareness and consciousness, increase your intuitive abilities and the means through which you receive “cosmic downloads” from your Interdimensional Support Team/Spirit Guides. The silica in your body is also the means through which you calibrate your energy bodies and set a vibrational tone to match the version of reality you want to experience, attuning to new energies and thus moving into a new way of being through inner alchemy. By consciously working with crystal grids you link up with the grand crystal grid throughout the Earth to both send and receive communication from the Unified Mind/Quantum Field. This is not something that exists separate from you ~ it exists within and around you. Your consciousness (frequency) emits a signal into the matrix and this is also reflected on a cellular level by the silica in your body. Source energy enters your spiritual and etheric bodies conducted via your chakra column and anchors this frequency into the Earth. 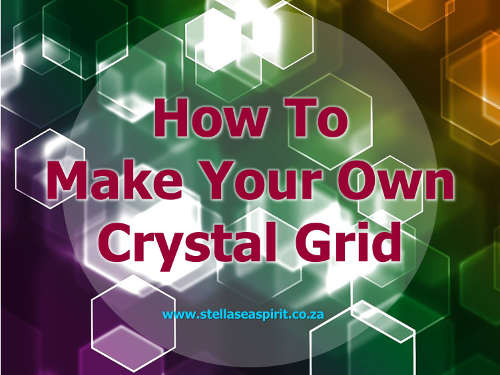 When you create a crystal grid it is a ritual gesture that symbolises you purposefully accessing the greater grid that is the fabric of the universe and weaving your intentions into it. This external gesture is really a reflection of the inner alchemy taking place inside of you. Silicates are the most common mineral in the Earth’s crust. Quartz crystals are formed by heat melting the chemicals of which they are composed (silicon dioxide) and forcing them into cracks and crevices where they fused and solidified into six sided crystals. Because of this chemical nature all quartz crystals have six sides. Even when melted they resume a hexagonal shape as they cool. That is why I prefer to use the six-pointed grid formation with my crystal grids for simple, timeless, fluid communication. Because crystals amplify the dominant consciousness surrounding them it is important to note that thoughts and emotions affect the very programming held within your blood crystals in this way. When you adopt new thinking patterns, visualise new scenarios and start replacing old habits with affirming ones that match the reality and behaviour of the person you wish to become you are effectively programming a resonant etheric blueprint of that version of reality for yourself, claiming it on a cellular level and facilitating its manifestation in the physical. That doesn’t mean micromanaging every little detail but it does mean incorporating the basic essence of your heart’s desires into the present moment and consistently carrying the thread throughout a successive series of moments until you wake up in the dream realising you have effectively become it. In turn this allows you to receive the possibilities and opportunities the universe brings to you that match who/what you are embodying. Have you ever noticed that when you pick up a favourite book you have read before how you always find something “new” in it that you didn’t discover before? That is because you are approaching the contents as a different person. 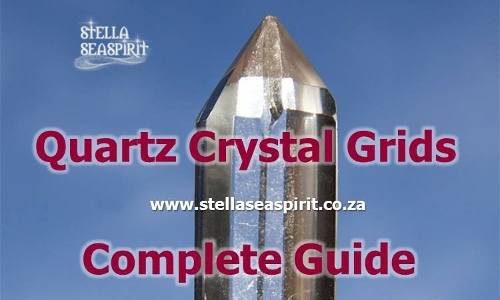 In the next post we will take an even closer look at the six-sided theme of quartz crystals’ molecular structure and how that is reflected within your physical constitution. When I cast ritual magick for you through my crystal grids I am able to transmit the most appropriate frequencies and light codes in accordance with your highest good directly into your etheric body. These codes stimulate any information, healing and latent abilities ready for activation at the most appropriate rate for you at that time. The cells in your body have a natural geometric structure and relationship that is quite similar to quartz crystal. Our DNA, blood and bones are all of a natural crystalline-like geometric structure that use both sound and light to communicate and transfer information. Therefore the energy released by quartz crystal automatically resonates with your own frequency on a quantum level. 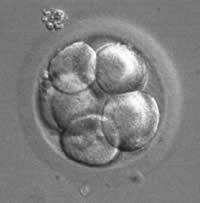 It is said that the blastocyst (first eight cells of an embryo) is the point at which it first begins to emit electrical impulses. This may denote the stage at which cosmic life force stirs from “above” in the physical plane “below”. Bearing this in mind the blastocyst looks akin to the six petalled Flower of Life. Cosmic life force energy intermingles with the stardust of which matter consists and animates your physical body. Without the life force energy that is responsible for your aura your body would be lifeless. The rainbow colours emanating from your chakra system correlate to those of quartz crystal prisms. Quartz crystal is also known as oxide of silicon. A large percentage of the human body is made up of silica (1 silicon atom and 2 oxygen atoms) and water (2 hydrogen atoms and 1 oxygen atom). No electron moves in a living system without the presence of hydrogen ~ an electron moves in a hydrogen cloud. Without hydrogen there would be no matter because your DNA strands are kept together by hydrogen bonds. Enjoy imagining all the hexagonal crystals within and around you gliding around, slotting into perfect position and enlivening all of Creation! I send Reiki blasts to all of my private mentoring clients via a crystal grid so the intentions and invocations raised resonate with the unique energy signature of your needs and whatever requires integration after our session. Now that you are familiar with the similarities at an atomic level within the human physical form, quartz crystal and hydrogen molecules we are going to build upon the idea that we are living breathing sacred geometry in motion and highly conductive in nature. Never ever create a quartz crystal grid to support a malicious intent. Only create them for positive, beneficial purposes. The Pyramid of Giza generates a vortex perpendicular to the Earth which is called a standing columnar wave. It is a swirling mass of energy travelling in a pulsed column of cycling energy. And so you are creating a spiral of energy like this in the centre of your crystal grid when you activate it. Your aura is an electromagnetic field. A column of swirling energy that surrounds you. Cosmic life force energy enters your crown and is conducted down through your chakric column and out your root chakra into the Earth. What dominant images, thoughts and emotions fuel your centre? The merkaba (known by many other names amongst which include light body or toric field) is also depicted as a six-pointed star hence the relationship between the two interconnected triangles depicting the union of the spirit “above” and matter “below”. A symbol of your own interdimensionality held within the very particles of which you consist. You are the communication device between the planes of spirit and matter. “As above so below” then refers to your physical body vibrating in resonance with the greater morphic field you wish to match and “as within so without” refers to your internal state of mind and emotion providing the filter or lens through which you experience your reality. The spiral of energy raised by the crystal grids you construct stimulate codes within your DNA, latent cellular memory and healing frequencies that support the version of yourself you are choosing to embody. Communication conveyed in this way can be experienced as subtle or dramatic depending on your individual progress ~ it’s all about what you need in that moment. Sometimes there is a gentle dissemination of information and at times it could be a rapid torrent of incoming “downloads” where you can’t seem to write (or type) fast enough. Direct healing/loving energy to loved ones remotely to wherever they are including pets. Use a name and birthdate or photo under the generator crystal. Create a devotional altar centred around angels, archangels, ancestors, spirit guides, ascended masters, avatars, deities, bodhisattvas or a specific archetypal energy E.G. Venus, Jupiter, Mercury. Infuse your paperwork with gratitude and a prosperity vibration as you make payments, calculate your budget, fill out your tax form etc. Remember if you have set up a long-term grid to charge it with your activator crystal every 24 to 48 hours until it has completed its task. What you give attention to expands. You may have set a grid up permanently for your home, in which case you could recharge it regularly from time to time using lunar phases or seasonal turning points as reminders.